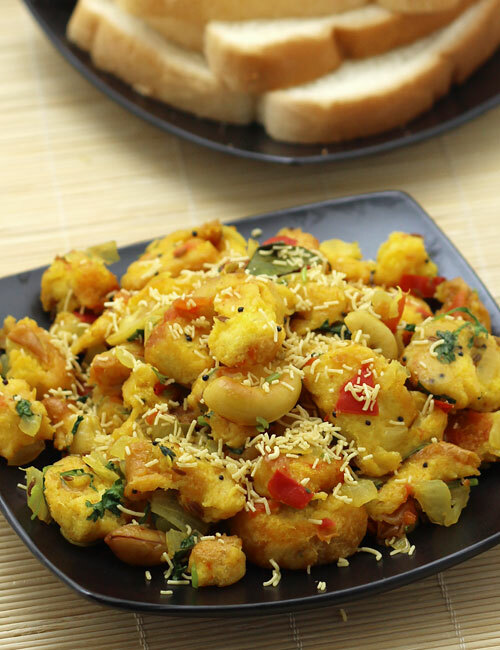 Bread Upma is easy to prepare and instant healthy dish for your breakfast. It can be eaten at any time of the day. 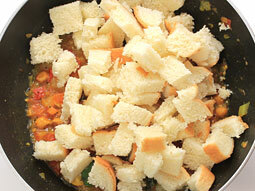 This recipe prepares bread as an upma and goes through same process as making rava upma. You can use white bread or whole wheat bread according to your choice in this recipe. To make healthy dish for breakfast, we recommend using whole wheat bread in place of white bread. 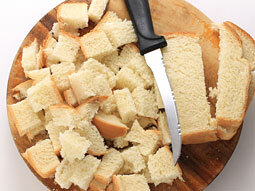 Cut bread slices into small pieces or cubes and keep them aside. 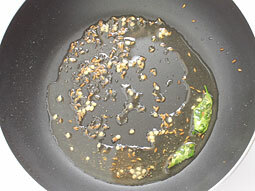 Heat 1½ tablespoons oil in a kadai or pan over medium flame. 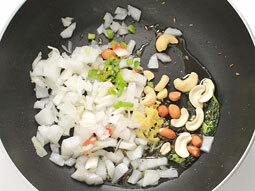 Add mustard seeds, cumin seeds and urad dal. When seeds begin to crackle, add asafoetida and curry leaves and mix well. 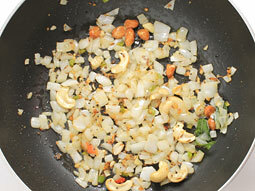 Add chopped onion, chopped green chili, raw peanuts and cashew nuts. Sauté until onion becomes translucent. 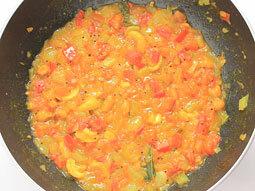 Add chopped tomato, turmeric powder and salt and mix well. 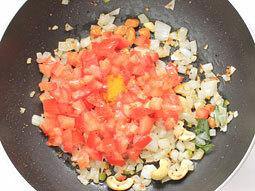 Sauté until tomatoes turn soft. 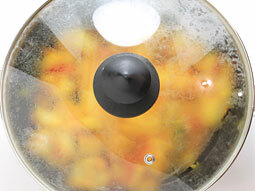 Add 2-tablespoons water, mix well and cook for 2-minutes. Mix well. Cover with a lid and cook for 2-3 minutes over medium flame. Turn off the flame and remove the lid. Garnish with chopped coriander leaves and serve hot with tea as afternoon snack. You can also garnish it with sev. 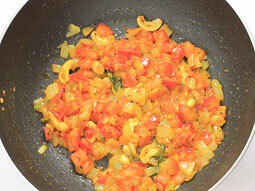 For variation, you can add vegetables like green peas and capsicum in step-5. Add green chilies according to your taste to make it more or less spicy. Do not add peanuts if you are allergic to groundnut or peanut. 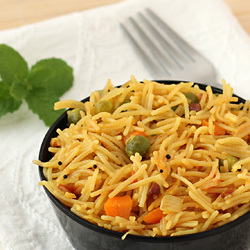 Serving Ideas: Serve Bread Upma with tea as evening snack or as a breakfast. Many south Indian households serve this food item as a dinner. Can we pack bread upma as tiffin or do we need to eat it atonce or it gets soggy? Response: You can pack it in a lunch box. Make sure that you pack it after it has cooled down to room temperature otherwise steam from it will make bread soggy in the lunch box. 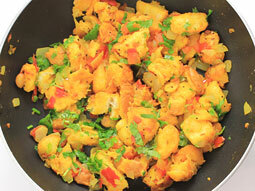 This bread upma receipe is very nice. Thanks. Thanks for receipes with photos. with all types of rice specially puliogere and all traditional. Instead of cutting the bread in cubes, tear it with your hand in small flakes, that way the bread will soakup more of masala and taste better......lovely bread upma.